You can never have enough good reference books. Even with the seemingly endless information that’s available on the internet, having a good reference book close at hand can save you hours of searching internet sites for a critical bit of knowledge. There are certain books that are part of my kit that I make sure to always have with me because the information they contain is so useful and job-specific that I’m sure I’ll refer to them numerous times during a show. One of these is the Backstage Handbook. It’s subtitle, “An Illustrated Almanac of Technical Information”, is a perfect description of it’s contents. Profusely illustrated with crisp black and white drawings, the book is a visual reference of hardware, materials and architectural elements. Written by Paul Carter, the book was originally written for those in live theater. Now in it’s third edition, the book includes chapters that pertain more to film work as well. I’m now on my third copy of the book as they often fall apart from heavy use. The book becomes my repository for notes, tables and other bits of technical info that I want to keep in one place. 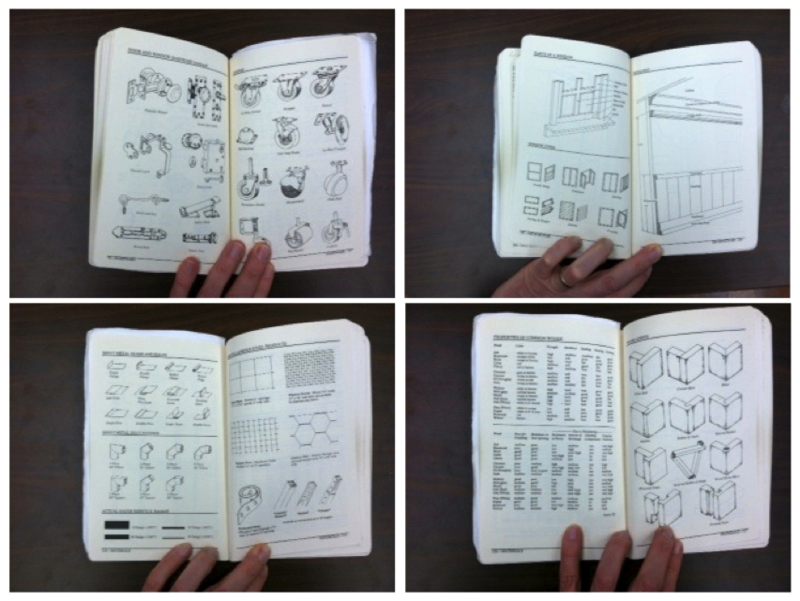 It’s a nice compact volume that provides a quick way to look up typical fasteners, steel sizes, material weights and sizes and a lot of other information you’ll often need without resorting to sifting through a McMaster-Carr catalogue or various other books. It’s published by Broadway Press and retails for $18, although you can sometimes find it cheaper through Amazon. This is definitely a book you should own. Years ago Sketchup developed a plugin for the industry called the Film & Stage plugin which allowed you to view a model with a set aspect ratio and allowed you to control the focal length of the viewing window. The plugin was never updated for newer versions and was eventually put aside once the company was acquired by Google. Many of us have moaned for years, begging for an update. I devised a way of setting the view window to get a correct view with specific focal lengths, but it was a tedious process and a painful one to try to demonstrate to others. In March Sketchup released a completely retooled version of the plugin that was everything I had hoped for and more. The new plugin, now called Advanced Camera Tools allows you to view your model with virtually any camera now available with any aspect ratio and with any focal length you choose. There is even a method of adding new cameras. Nearly every camera in use in the industry is included with the pre-sets as well as all the RED cameras. Aidan Chopra, product evangelist for Sketchup told me that updating the plugin really hadn’t been on the company’s radar until they held their semi-annual Basecamp last year in Boulder. The event was attended by Local 800 member Brad Rubin who pitched an update to them at that time. While it still didn’t make it onto their hotlist, the idea was intriguing to one of their software engineers, Brian Brown. The company offers to let their employees use 20% of their time working on side projects and Brian decided to use his time reworking the old Film & Stage plugin. So, we really have Brian and Brad to thank for making these tools available again. While the plugin is as intuitive to use as Sketchup, there are things about the plugin that work differently when you are working inside it as opposed to the normal Sketchup tools. The plugin is free, but works only with Sketchup Pro versions. With a little effort you can quickly save multiple camera views and know that they are fully editable without having to create entirely new views if the lens or camera information changes. 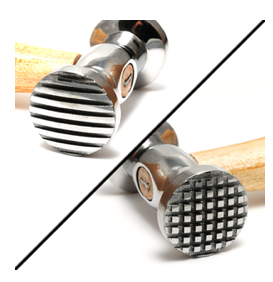 If your favorite guy or gal woes the day they had to give up their lead, you’ll have them sobbing with joy when they open the box and find three hand- sharpened pencils. 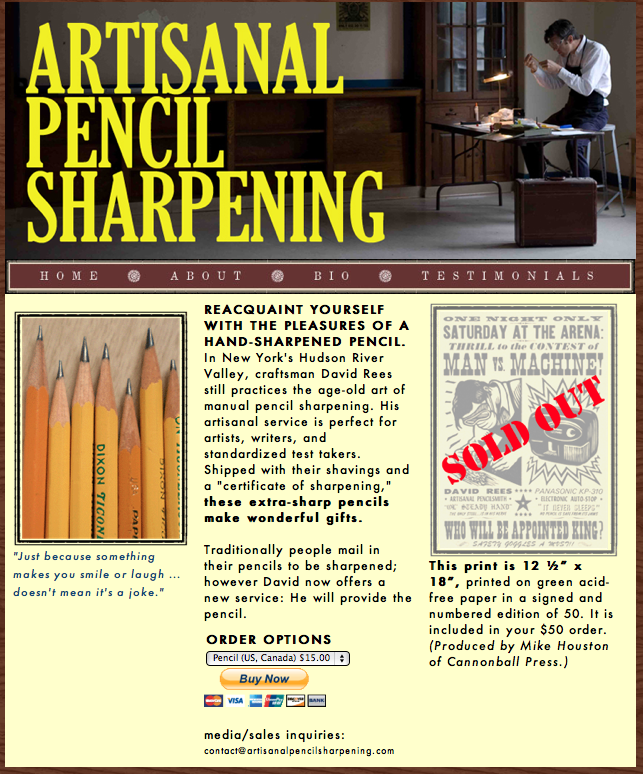 New York’s David Rees has reinvigorated this age-old art form and will send you three needle sharp pencils along with a certificate of authenticity which certifies that they are now deadly weapons. Or maybe they’d prefer a big block of wood. Actually it’s a big stack of post-its camouflaged as a block of wood. 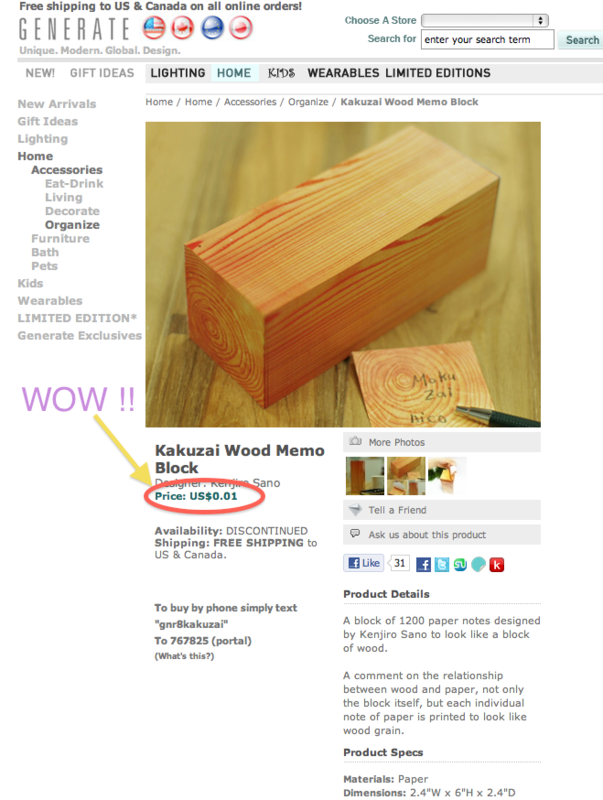 Somehow I doubt it’s actually 1 cent, but you never know, it is just wood pulp after all. Or, how about a high tech computer monitor adjustment tool. It’s just the thing for fixing a finicky monitor. It comes with two faces, one for the traditional lined CRT monitors and the other for the standard square pixel monitors. Just apply the proper face to your screen several times, or until you’ve calmed down. I’ve found it works great on sticky keyboards too. Heck, it’ll fix just about any gadget that’s causing you trouble. And you’ll feel so good afterwards. The price does not include a replacement monitor. But, maybe you’re sick of those slick high tech gadgets and want something that’s a little more environmentally friendly. Well. how about something that’s ‘green’ and has historical provenance (sort of). James Townsend & Son ( http://jas-townsend.com ) carry a reproduction of a brass and ivory notebook like one carried by Thomas Jefferson. It’s sort of a forever-notepad. 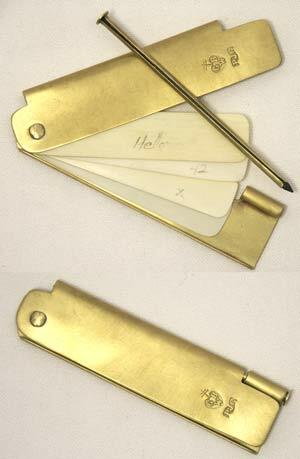 The brass cover contains four ivory leaves that are reclaimed from 150 year-old pianos. 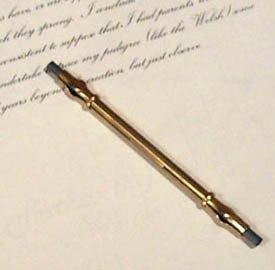 You write on the leaves with the brass closing pin that contains a replaceable lead. To clean the sheet you just wipe it with a moist finger or cloth. If the $90 seems steep, just remember that this will still work perfectly 100 years from now, long after that iPhone is at the bottom of a landfill. For something a little lower on the price scale, they also carry reproduction Porte Crayon for $15 that come with handmade lead refills. They refer to them as mechanical pencils in their online catalogue. So, you need to work out the proportions of Doric or Ionic column and you left your reference books at home. They must be on the web, right? Yes they are, if you look in the right place. 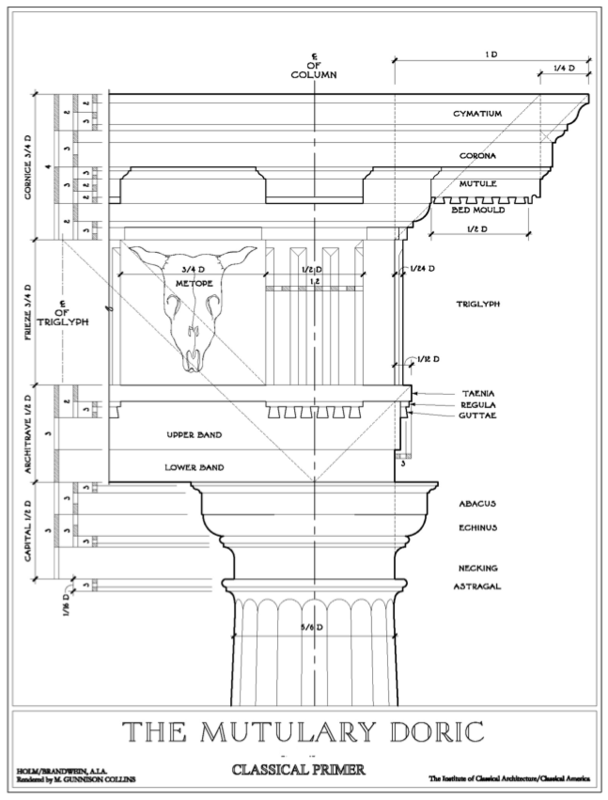 The Institute of Classical Architecture & Art has a nice on-line reference of the five orders that’s very clear and easy to use. 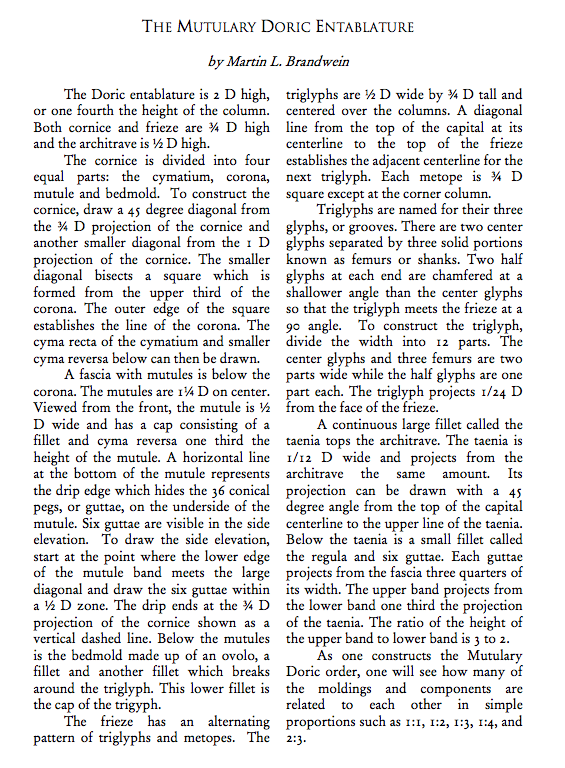 You can download each of the pages as a PDF, or just bookmark the site for easy reference. You can find it here. 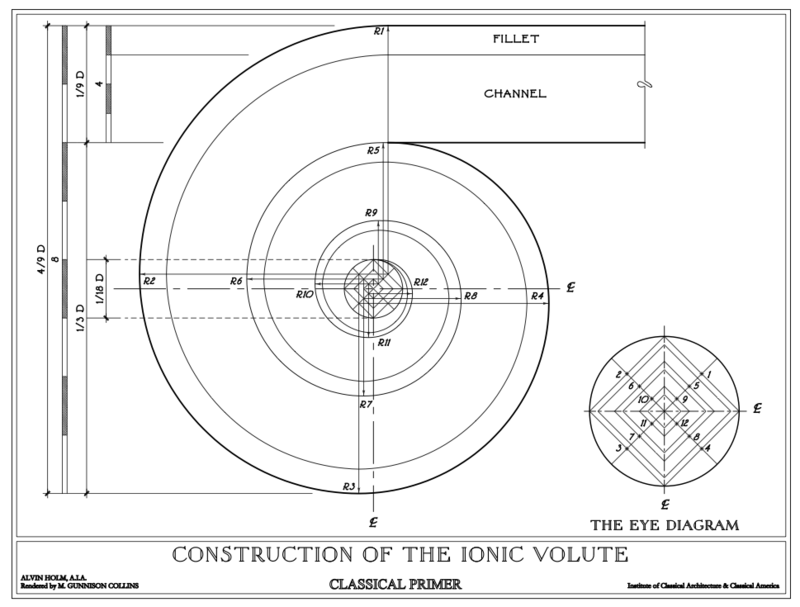 Each of the drawings is accompanied by a brief but thorough explanation of the order and the proportions and nomenclature for each of the components. Now you don’t need to panic if you can’t remember how to lay out the entasis on that column. Early motion picture personnel were at the bottom rung of the ladder as far as the locals were concerned. Apartment buildings often had signs posted declaring neither persons owning animals nor those having employment in the film industry would be rented to. The iconic and once luxurious Garden Court Apartments, which stood on Hollywood Blvd., held out against admitting actors until 1918. The town was flooded by young people, believing it was easy to break into the glitzy new industry as ‘extras’. Thousands arrived, particularly young women who were shocked to find that not only had thousands of others had the same idea but the studios were not centrally located and were actually many miles apart making it difficult just to visit the various casting offices in a single day. 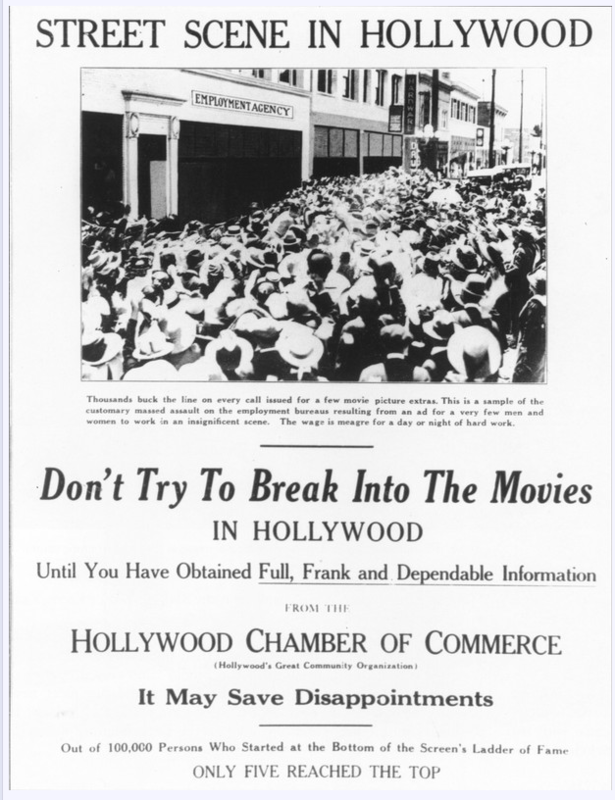 The town soon began publishing notices around the country, trying to impress on young wanna-be actors as to the reality of the situation and discouraging them from coming to Hollywood without a contract or contacts. Hordes of youth faced starvation, poverty, and sometimes even suicide. By 1922 there were over 30,000 people in Hollywood seeking extras work. The oversupply naturally led to exploitation of young women and the industry soon had a PR nightmare on their hands. Some officials were calling for government regulation which is the last thing the production companies wanted. Republican Party leader Will Hays, creator of the infamous Hays Code, would try to alleviate the situation by creating Central Casting as a way to control the pandemonium which was occurring daily at the studio lots. It gave the process legitimacy but it failed to stem the flow of eager youth into the once-sleepy town. 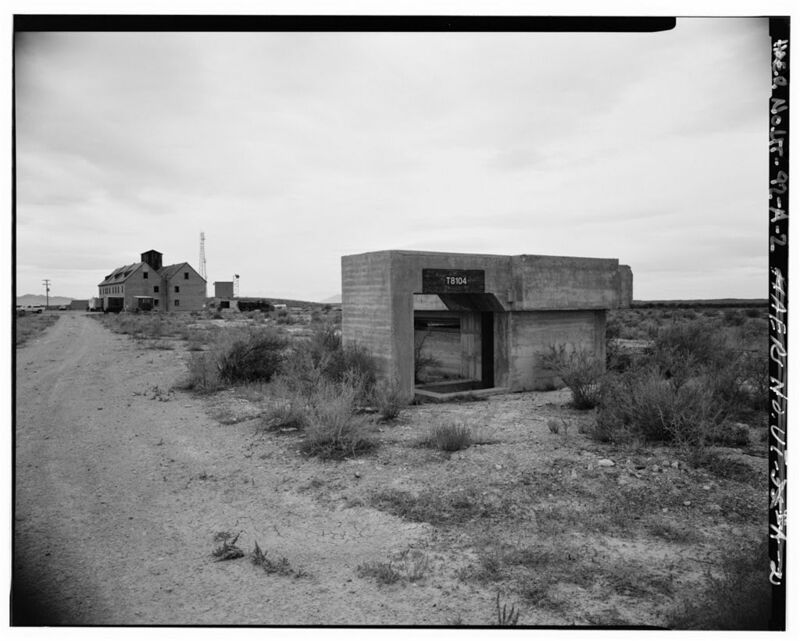 In the middle of the Utah desert there stands a brick three-story copy of an early 20th century German tenement building, a relic of World War II and a secret program that involved the RKO Studios Art Department. Stories about Hollywood’s creative elite being involved with the military during World War II are part of its history and mystique. But it wasn’t until recently that I had found much information about any exploits involving Art Directors or Art Department personnel in the war effort beyond work on films contracted by the government. While I was doing some research for a documentary, I was looking through past articles in the German magazine Der Spiegel and my eye caught a story entitled, Angriff Auf “German Village”. Curious as to why part of the title was in English, I scanned the article and saw the words “RKO Studios.” The story recounted a secret U.S. government program designed to test the effectiveness of firebombs by building a mock German and Japanese village in the middle of the Utah desert. The top-secret program would involve the help of a number of renowned architects and the RKO Studios Authenticity Division. What was the “Authenticity Division”? My interest was piqued. Once the United States entered the war it became apparent that in the event that gas and biological weapons were used, there had to be a place far enough away from populated areas to test these and other weapons. Roosevelt set aside over 120,000 acres in the Utah desert as land for weapons testing near the Dugway Mountains. 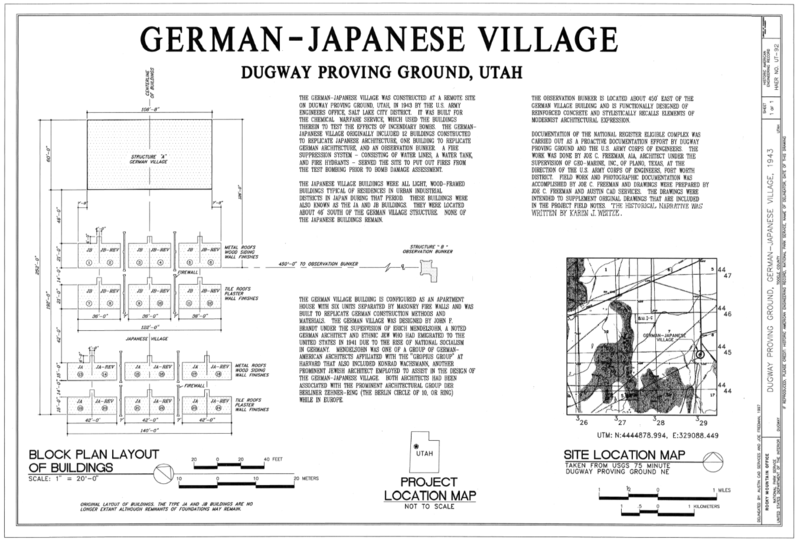 By mid 1942 The Dugway Proving Grounds was open for business. The U. S. Army had made it a point early in the war to not target civilians during bombing raids but was now facing pressure from the British to do so. After being bombed continuously themselves, as far as the British were concerned, the ‘gloves were off’. Churchill pushed Roosevelt to deliver 500,000 top-secret ‘N’ bombs, which contained anthrax. He surmised that with the munitions he could wipe out at least half the population of the 6 largest German cities in one week. Roosevelt blanched at the idea and his Secretary of War argued that the U.S. didn’t want to help perpetrate an atrocity on the level of Hitler’s own terrible acts. Roosevelt instead offered to provide a more effective firebomb to help in Churchill’s aim of destroying Berlin. Previous attempts with the weapon had been ineffective because of the predominately masonary construction of the tenement buildings in the city center. Like nearly every major corporation, Standard Oil was contracted to work for the military during the war and began developing an improved incendiary bomb. In comparison to high explosive bombs, incendiaries were designed to start fires. Standard Oil had designed the M-69 bomb, which contained a jellied gasoline, making it harder to put out a fire it started. When white phosphorous was added, it made a deadly combination of which even a pea-sized glob could burn a human limb down to the bone in moments. The substance burned furiously even when submerged in water. 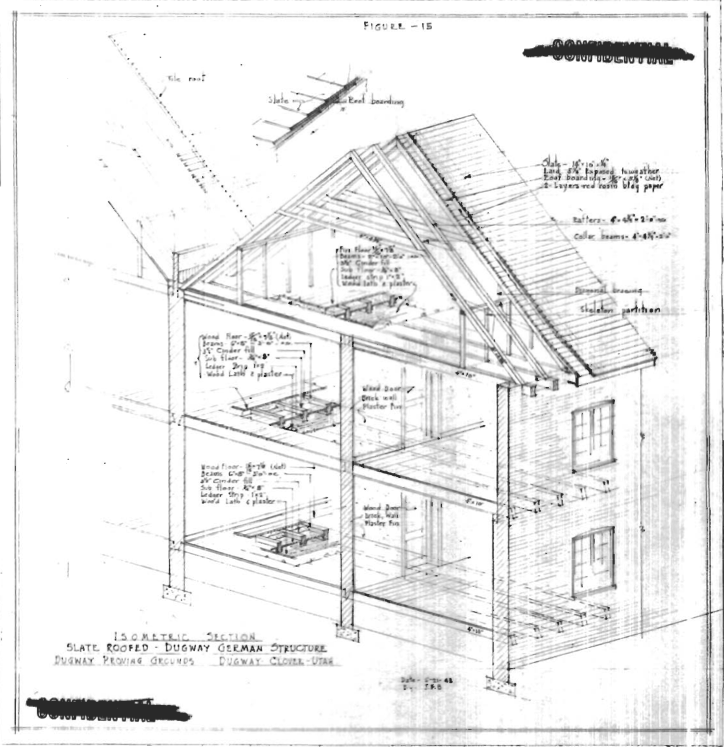 Roosevelt ordered it to be tested immediately and suggested that exact copies of German and Japanese houses be built to test them on. 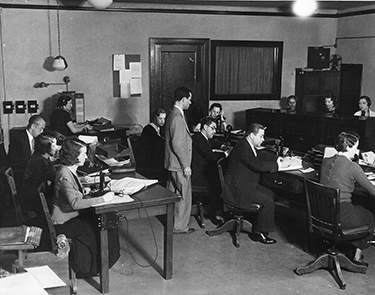 At some time in early 1943, RKO Studios was approached by the Standard Oil Development Company to authenticate and design furnishings for the German Village portion of the test area. Many people have attributed RKO being sought out because the studio had produced Citizen Kane, but it would be years before Kane was considered the masterpiece it is today. What is more likely is that RKO was approached because someone at Standard Oil had been to the movies recently. On January 6 of that year, the studio had released a picture entitled, “Hitler’s Children” which was immediately a blockbuster and would become the biggest success of the studio to date. The film, based on a book, recounted the story of a young German-American girl trapped in Germany and forced to participate in the Lebenborn program, where young girls were encouraged to become pregnant out of wedlock to provide future soldiers for the Reich. Because the film had a patriotic purpose, that of showing the horrors of life in Nazi Germany, the ethics board approved the film even though it contained such racy material as the lovely starlet Bonita Granville’s blouse being torn from her back and then whipped. It made for great box-office receipts. Made for around $200,000, the studio knew they had a winner the opening weekend. The Pantages Theater in Hollywood reported that “records for initial attendance were smashed to smithereens.” The film would end up making back nearly 13 times the original investment. The film’s director, Edward Dmytryk was one of my Directing instructors at the American Film Institute. While discussing the huge bonuses being handed out by the studios, he recounted that “Hitler’s Children” was so successful the studio gave him a $5000 bonus. While paling in comparison to today’s bonuses, the sum was quite a substantial one at that time. Because the movie dealt with domestic life in Germany and involved creating typical German interiors, the studio would have been an obvious choice for the job of recreating accurate dressing of civilian apartments. The Art Directors on the film were Albert D’Agostino, who was the Supervising Art Director for all RKO films, and Carroll Clark. It’s not known if they were the individuals actually involved in the government program. A local Utah contractor had been hired to build both villages, which were side-by-side. 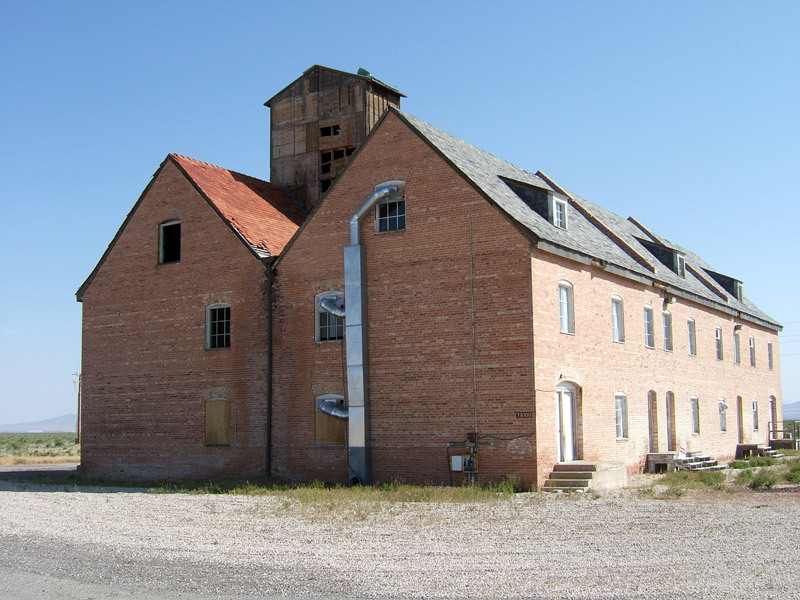 With a mandate of less than two months to complete the buildings, the contractor pleaded for help with getting manpower and was allowed to use inmates from the Utah prison as construction workers. The Japanese Village was designed by the Czech architect Antonin Raymond who had worked with Frank Lloyd Wright on the Imperial Hotel in Tokyo. He had set up his architectural practice there and would become known as the father of modernist Japanese architecture. 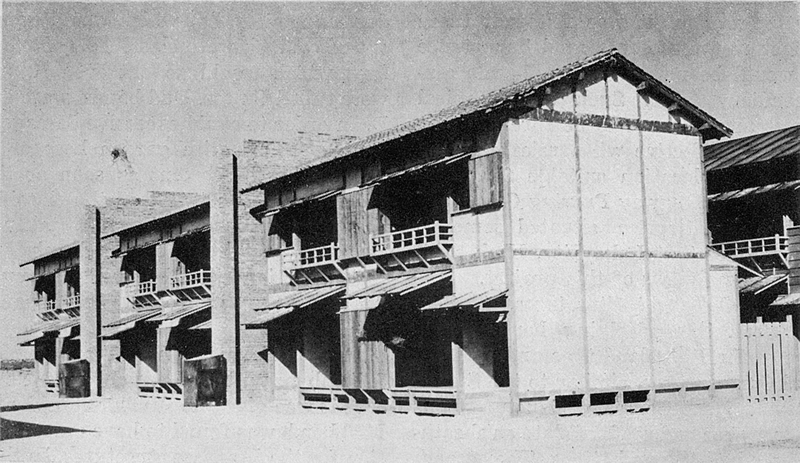 Intimately familiar with the typical wooden structure of Japanese houses, he provided construction drawings and suggestions for building materials. The German Village had been designed with assistance from the famous architects Erich Mendelsohn, Konrad Wachsmann and others from the Walter Gropius group at Harvard. The structure was designed as a duplex unit divided into 6 apartments, all having a second floor and an attic, which was the most flammable part of the building. The structure was mostly masonry and the floors of this type of building were not only more massive, they contained a 3 1/2 inch cinder infill that made it very difficult for a fire to burn more than the upper floor and attic. 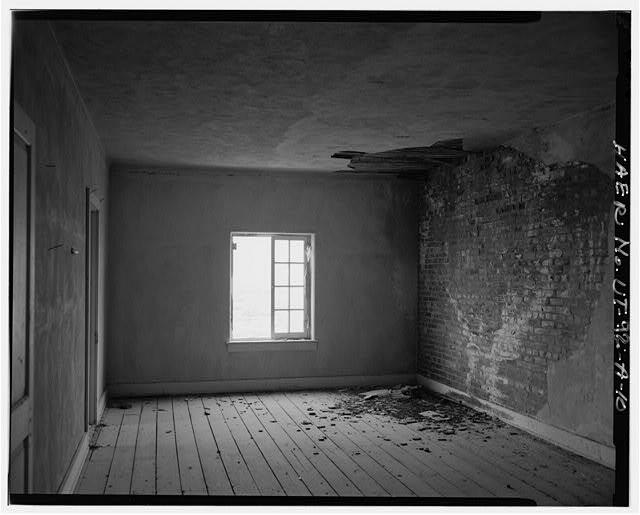 Because of this the first floor was left unfurnished and only the top floor was dressed. 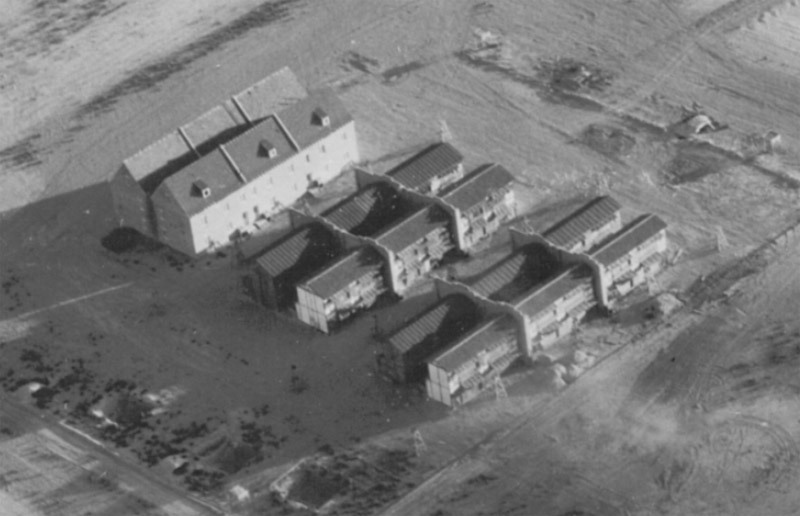 The list of furnishings needed to dress the buildings for the tests was staggering considering they had to all be built in a very short time. 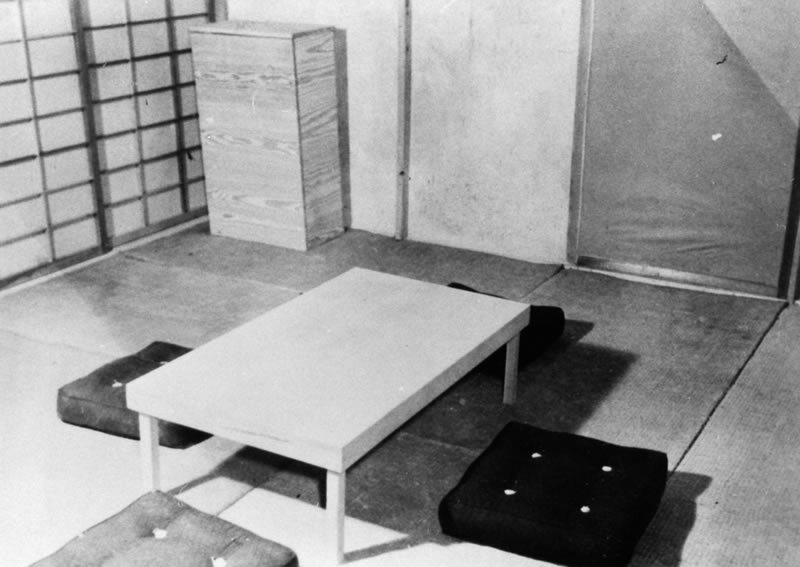 Over 760 pieces of furniture were called for as well as over 700 mattresses, pillows and drapes and over 900 tatami mats were needed for the Japanese buildings. Every tatami mat in San Francisco and Hawaii was rounded up and sent to Utah. When these proved insufficient, others were constructed using Mexican ixtle fiber as a substitute. A shipment of lumber from Murmansk was captured and used to simulate Japanese building materials and rattan was used in place of bamboo. The German Village was a block of 6 rowhouses built back-to-back to mimic the German ‘mietskaserne’ or ‘rent barracks’ which were the typical low rent living quarters in the large cities such as Berlin. Normally 5 to 6 stories high, the ones built at Dugway were only two stories plus the attic area. 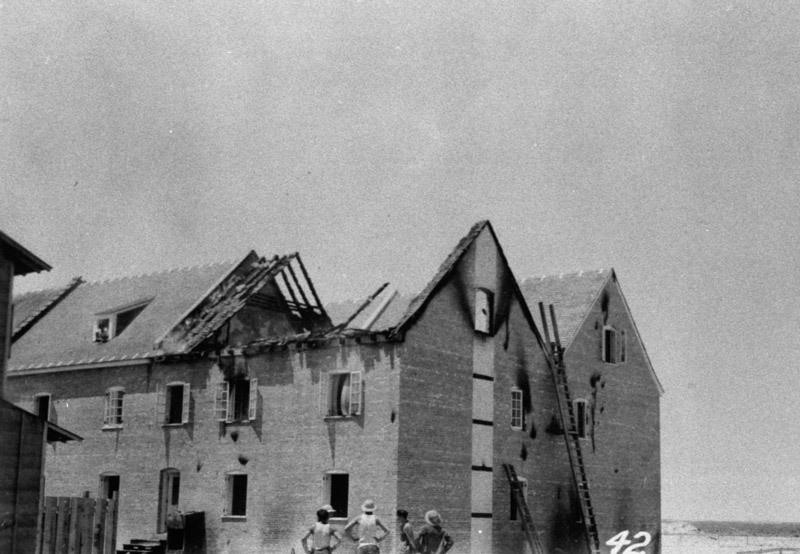 The attics were the only portion of the brick buildings that were mainly wood and were the target of the incendiaries. One side was built with the western German style of slate over boards while the other side’s roof was covered with tiles over battens as was common in Berlin. Douglas Fir and Southern Pine were used to simulate the typical German Kiefer wood for the flooring, roof joists and beams. 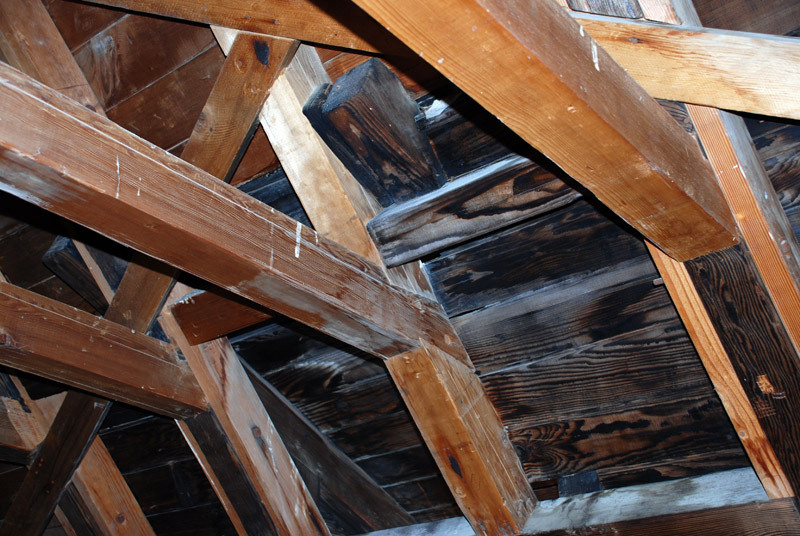 Because the tests needed to be as accurate as possible, soldiers were assigned to constantly spray the exposed inner framework with water to keep the wood’s moisture content from falling in the desert’s low humidity. 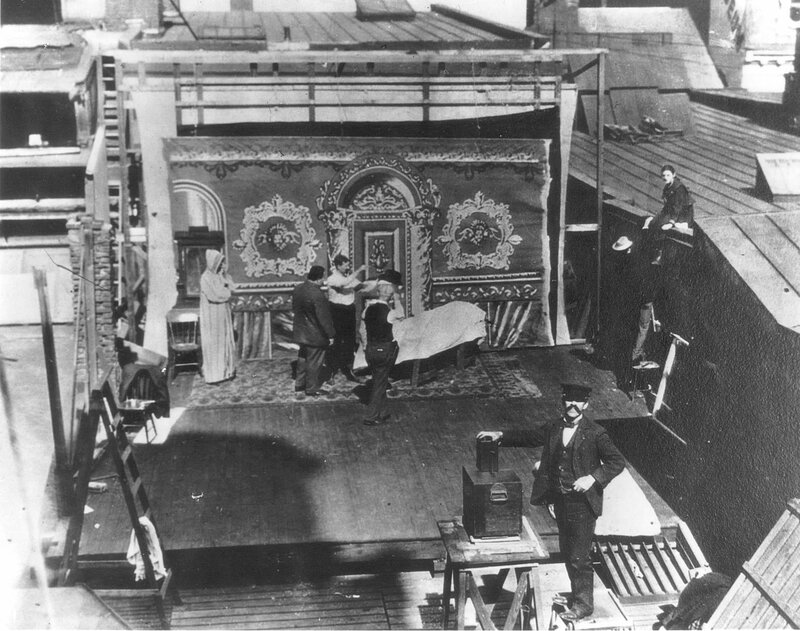 The furnishings design had been contracted to a New York designer and much of the furnishings were built there. But the sheer number of pieces involved required several other entities, including the RKO prop shop, to create pieces as well with the RKO staff approving the designs and construction materials. Samples of German drapery and bed linens were tested for flammability and similar fabrics were procured. Once the furnishings were completed and had arrived at the site on May 14, two RKO staff members supervised the installation based on the interior layout created by the art department. The small rooms were filled to match the congested look of the average German tenement apartment with beds, sofas, cabinets, cribs, table and chairs and the furnishings were completed with the addition of cushions, bed and crib linens and window dressings. 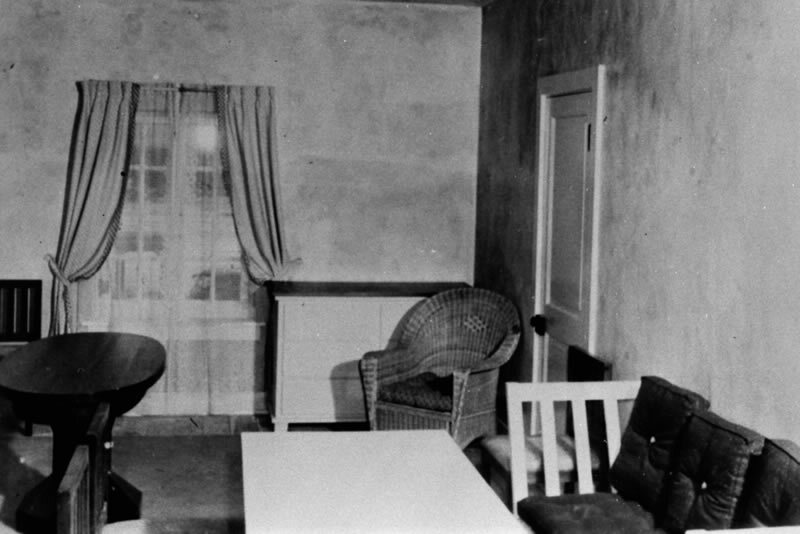 The black and white photographs taken of the rooms on May 16, 1943, the night before the tests began, look much like set stills that the RKO employees would have taken of hundreds of other sets before. The villages had been completed in 44 days. Bomb tests were begun the next day and were repeated for nearly four months. Each time the structures were quickly repaired and refurnished. 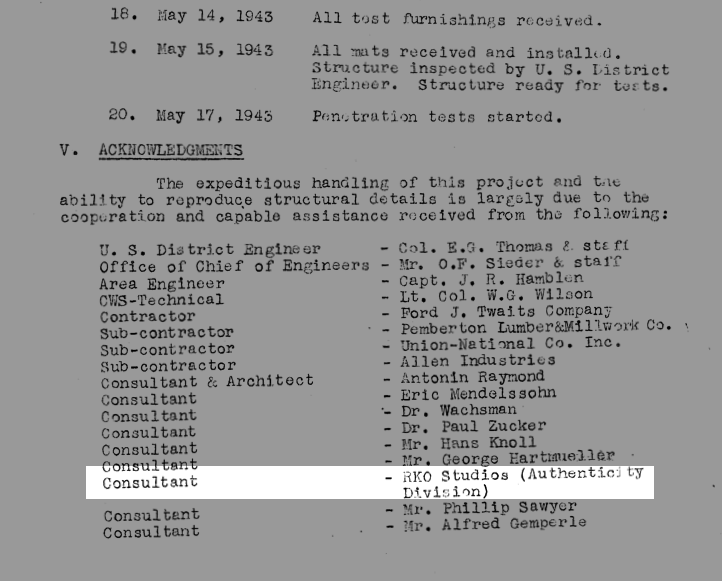 Unfortunately there is nothing in the Standard Oil report that names personnel involved with the project. In the acknowledgement the credit reads – “RKO Studios – Authenticity Division”. So the question is, who were the two individuals from RKO who supervised the final set dressing and who were the other members of the Authenticity Division at RKO? Several days of research including an afternoon at the Motion Picture Academy library turned up nothing on an ‘RKO Authenticty Division’. What I think most likely happened is that the technical writer who prepared the report, called the studio to find out who to attribute the work to. When he was told the “Art Department”, they most likely assumed the person at the studio was mistaken as the work involved more than artwork, and thus created the title “Authenticity Division” as this more clearly described their contribution. Who exactly those individuals were will probably never be known.